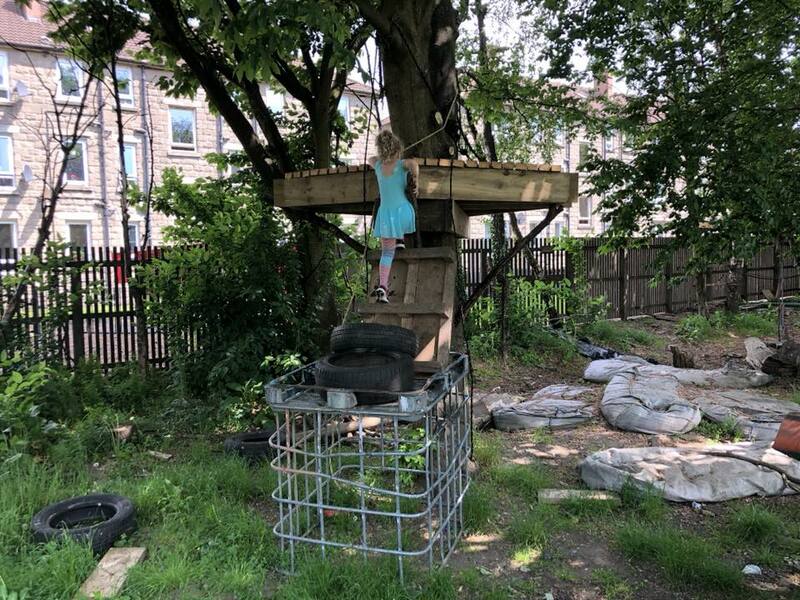 We had an hour to spare on a Saturday a few weeks ago, so we decided to head to Baltic Street Adventure Playground in Dalmarnock to check it out. 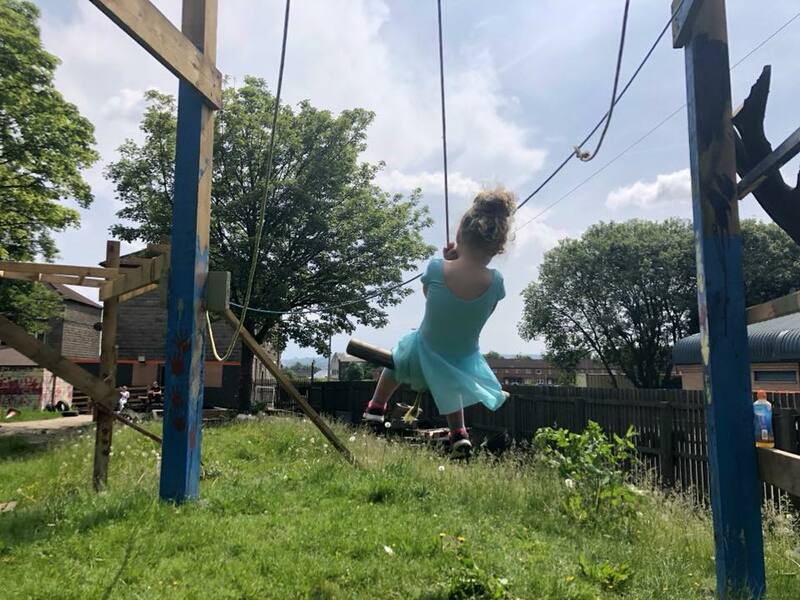 Baltic Street Adventure Playground is a supervised adventure playground for children aged from 6 to 12 years, though younger children are welcome to come along and play if they are accompanied by a carer or guardian. It is an independent CIC which exists to provide an environment where children are supported and enabled to act on their right to play in the fullest possible way. It’s really different to any other playground we’ve been to and it doesn’t look like much when you walk in. It’s not the polished metal or wooden playparks with mulch or rubber on the ground below that you see everywhere else you go. 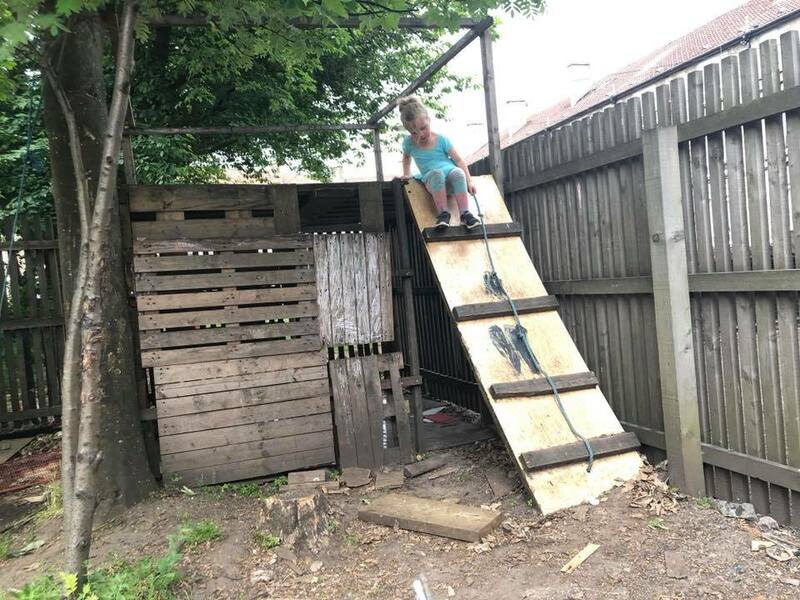 There are climbing frames made out of bits of scaffolding, bits of wood, old pallets, scrap metal, and whatever else the guys who run it can get their hands on. Basically it’s a big junk yard that kids can play on. And I mean that in the best possible way. One of the climbing frames has a platform built on the tree. It’s pretty high up – I couldn’t reach the little lady when she was up there. Underneath are a couple of crash mats and the kids, old and young were leaping off the platform onto the crash mats below. The little lady is no stranger to climbing. In fact I need to warn her before we go certain places not to climb on stuff when I know in advance that it’s not going to be appropriate. She enjoys soft play, but it doesn’t challenge her. 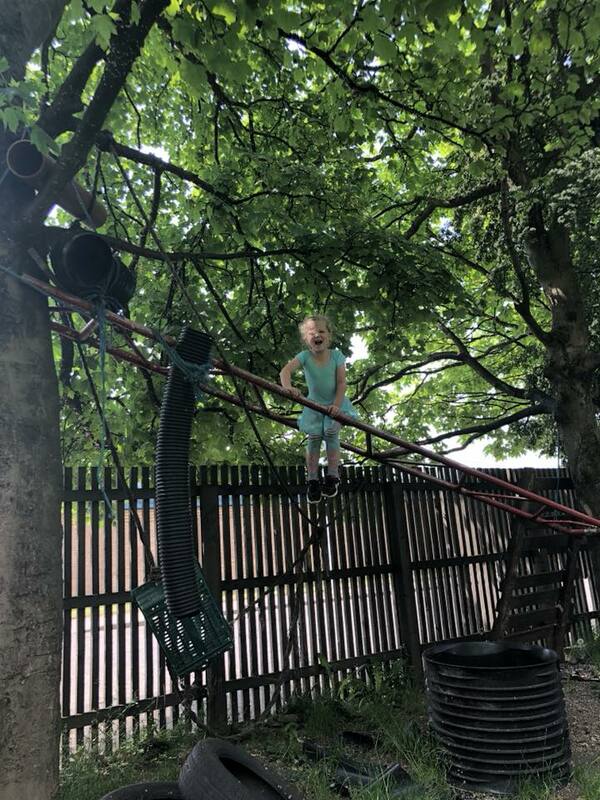 She loves getting to the top of a climbing frame, but we rarely come across one that challenges her. This place really challenged her. She was out of her comfort zone and after she’d warmed up a bit to the newness of it all, she absolutely loved it. Even in the hour or so we were there the little lady’s confidence grew, and by the end she was jumping off the platform with us standing near her, which she definitely wasn’t up for doing when we first arrived. She also really loved playing in the dens made out of scrap wood and metal and getting up on top of them (she has to get to the top of everything). There were also tree swings of varying sorts and a big tunnel through a mound in the grass. Baby boy had a nap for almost the entire time we were there so he didn’t play with much of it. However most of the climbing equipment he wouldn’t have been able to go on anyway; he’s just too wee. His legs are too little and he’s still at the invincible gung-ho stage where decision making is basically either nope, or LET’S DO THIS!!! But when he woke up he really enjoyed playing in the sand pit with sticks and cones, and picking some dandelions when it took his fancy. The whole point of Baltic Street Adventure Playground is that it’s child-led. 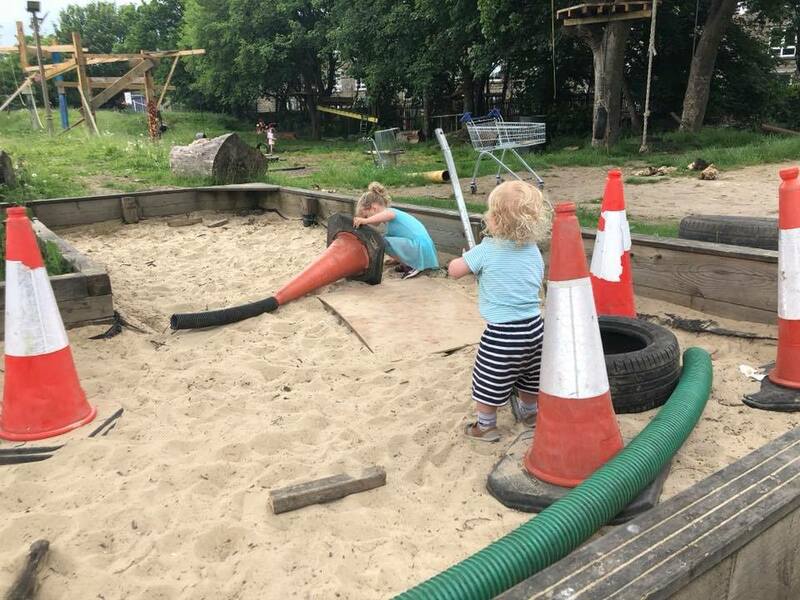 There are tyres and sand bags and cones and bits of wood around that the kids can use to do whatever they want. There were a couple of kids making a den when we were there, and another few moving tyres around to make an obstacle course for themselves. Kids can choose what to do when they’re there, and they can get involved in everything – even the day-to-day management or the development of the site! The staff are absolutely wonderful with the kids. They’re funny and kind and they deal with everything that comes along incredibly well. If you’re there at the right time and Alan, Robert or Alistair are cooking you might even get a wee munch! The little lady was delighted to snaffle a bit of pizza on our way out. Everything about Baltic Street Adventure Playground is free. The playground is free to enter, kids are free to come and go, and they are free to play as they choose. Baltic Street Adventure Playground is different to any other play area we’ve been to. There’s loads for kids to climb and swing on and jump off and play with. It’s fun, it’s exciting; it’s risky play at its very best. And it’s completely free. The little lady had a brilliant time and even in the hour we were there she started trying more difficult things.I can’t recommend it highly enough. It’s definitely aimed at kids who are a bit older so if you have a toddler I’d wait until they’re able to climb a bit before you take them along. 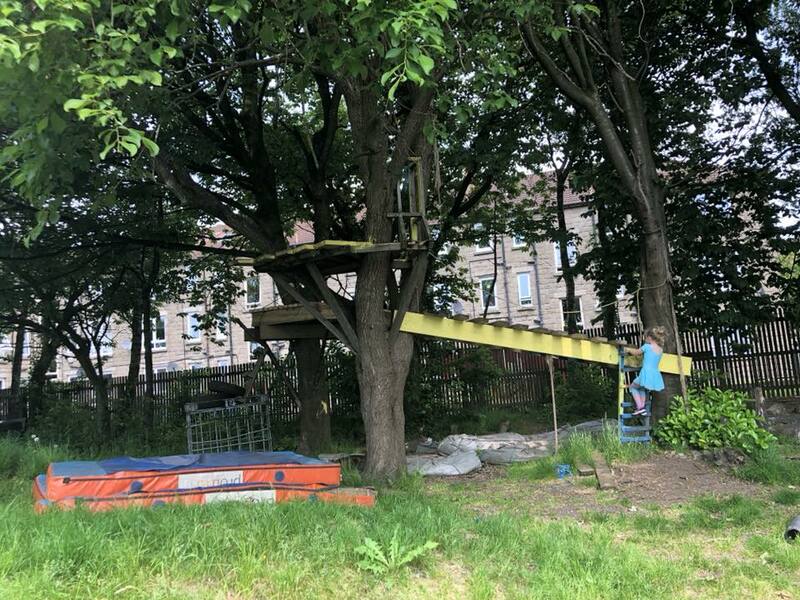 Baltic Street Adventure Playground is located in Dalmarnock at 421 Baltic St, Glasgow, G40 3EU.